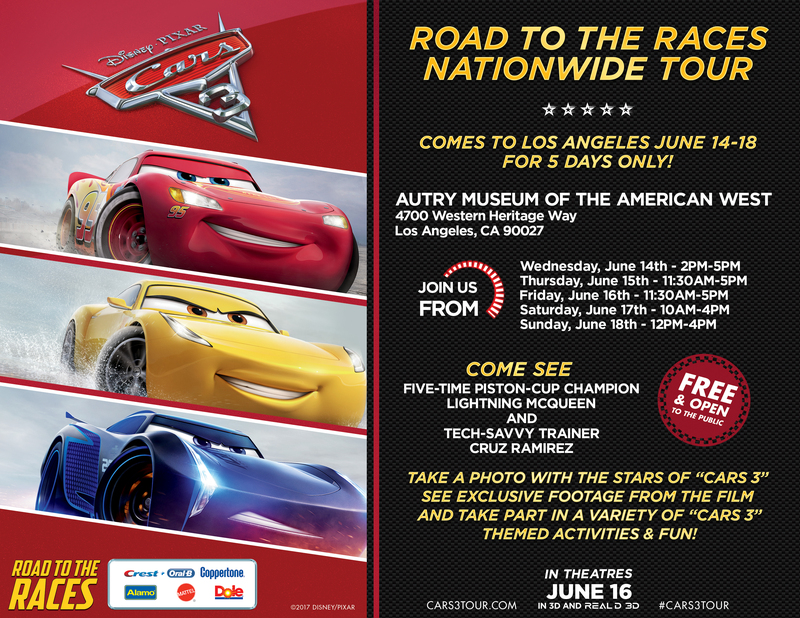 Road to the Races, a nationwide tour inviting fans of #95 to gear up for the upcoming big-screen release of Disney•Pixar’s “Cars 3.” Fans will take part in a host of activities and get a sneak peek of the movie. WHO: Life-size, character look-alikes of five-time Piston-Cup champion Lightning McQueen and tech-savvy Cruz Ramirez will be rolling into town to celebrate “Cars 3” with local fans. ACTIVITIES: · Alamo Rent A CarSM is hosting a street art booth and will bring “Cars 3” to life with a giant coloring mural featuring Lightning McQueen and friends, along with a color pencil pack souvenir. Owned and operated by Enterprise Holdings, Alamo Rent A Car offers low rental rates and a hassle-free customer experience at the most popular travel destinations around the world. · Coppertone® is creating a racer pit crew that encourages visitors to take part in a tire-changing activity and photo-sharing opportunity. A leader in the sun care industry, Coppertone is made by Bayer HealthCare, LLC. · Crest® and Oral-B® celebrate the Road to the Races tour, providing fans with an opportunity to create a digital postcard with Lightning McQueenand get “Cars”-themed oral care products. Crest and Oral-B are the first step to enjoying a lifetime of healthy smiles. · Dole®, the leader in fresh, quality produce, invites visitors to fuel up and recharge their batteries, sample high-octane fruit and vegetable smoothies, collect “Cars 3”-inspired recipes and discover how Dole and Disney are working together to make healthy living fun and easy for families. To see more of Dole’s exciting promotions around summer family fun, visit www.dole.com/Cars3. · Mattel presents an interactive play area, which sends Lightning McQueen and other racers down the gravity drop and launches them into action in new play sets that feature locations from the movie. Also on display will be a collection of die cast racers from past and present. Mattel is the leading global childhood development and play company. Fans will be able to catch a sneak peek of the movie in the Cinetransformer Mobile Movie Theater. Visitors will also be able to take photos with the life-size character cars. In addition, the sports national youth program NASCAR Acceleration Nation will display the science behind NASCAR racing, and elements from the NASCAR Hall of Fame will allow attendees to get up close and personal with the history of NASCAR. Mack Trucks, Inc. will transport the life-size character cars on the coast-to-coast tour. ABOUT THE MOVIE: Blindsided by a new generation of blazing-fast racers, the legendary Lightning McQueen (voice of Owen Wilson) is suddenly pushed out of the sport he loves. To get back in the game, he will need the help of an eager young race technician, Cruz Ramirez (voice of Cristela Alonzo), with her own plan to win, plus inspiration from the late Fabulous Hudson Hornet and a few unexpected turns. Proving that #95 isn’t through yet will test the heart of a champion on Piston Cup Racing’s biggest stage! Directed by Brian Fee (storyboard artist “Cars,” “Cars 2“), produced by Kevin Reher (“A Bug’s Life,” “La Luna” short) and co-produced by Andrea Warren (“LAVA” short), “Cars 3” cruises into theaters on June 16, 2017. MORE INFORMATION: The roster of cities has included Miami, Dallas, Chicago, Boston, New York, Philadelphia, Denver and Los Angeles, among others—the full list is available atCARS3tour.com. The life-size character cars also roll onto the red carpet for the “Cars 3” world premiere on Saturday, June 10, 2017. The “Road to the Races” nationwide tour wraps up in California with a visit to NASCAR at the Sonoma Raceway June 24-25, 2017.